If you are familiar with Pinterest, and Tumblr, then you know how much fun it can be to create a topical board filled with pictures, articles, and videos to. Life science social media is like a pendulum, swinging back and forth between favor and disfavor. Understand its relevance to your business to leverage it. Back in July, 2011, Americans spent around 88 billion minutes each month on social networks. That's nothing compared to how much time was spent on social networks a year on, as a recent report from Nielsen reveals. Held in the Aria Resort & Casino Convention Center in Las Vegas, the SMX Social Media Marketing Conference is a two day conference in the SMX Series. Google Brings YouTube And Google+ Closer Together With YouTube Tab, Easier Sharing Of Uploaded Videos | TechCrunch: "Google continues to integrate its Google+ social network deeper into its wide range of other products. YouTube already has an extensive Google+ integration, but now the two services are getting even closer. Google just expanded the connection between the two by making it easier to share new public videos to Google+ after they are uploaded and by highlighting users’ public YouTube videos on their Google+ profiles. Google is also renaming the Google+ “Videos” tab to “YouTube.” Clicking on this tab in a user’s profile now sends users directly to their YouTube channel. This feature, says Google’s Dom Carr, is meant for “those of you who are aspiring musicians, pundits, comedians, or brands.” By giving users another avenue to their YouTube channels, Carr writes, these users will be able to “grow [their] audience even faster with Google+.”. . ."
"Is there any indication when this feature will roll out to company pages? I'm getting more and more frustrated lately trying to keep clients' Google presence in order and the fact that we are essentially forced to make up fake people really complicates things when doing things like linking Google+ profiles to YouTube channels! It seems that no company has been able to consider the business user right from the start despite the fact that they court marketers like crazy when they launch new products." Dana White Explains the UFC's Social Media Choke Hold: "Over the past several years, UFC President Dana White has transformed the Ultimate Fighting Championship from a violent sideshow into an accepted part of the American sporting mainstream. That image overhaul is thanks in no small part to social media, where the UFC is one of the most successful sports organizations around. White himself is a social powerhouse, too, with more than 2.3 million followers on Twitter. (NFL commissioner Roger Goodell, by comparison, has 345,000.) Well over 400 UFC fighters are active on Twitter, and for good reason -- in 2011, the league became the first to offer athletes bonuses for outstanding Twitter engagement and creativity. The UFC's most-followed fighter, Anderson Silva, now has 2.8 million followers. On Facebook, where it has nearly 1 million likes, the UFC became the first sports organization to stream a live event when it broadcast a series of preliminary bouts for UFC Fight Night 23 in January 2011. Its YouTube channel has more than 333 million total views and the company says its individual videos average more views than the NFL, MLB, NHL and NBA combined. Pinterest and Spotify have become other areas of social emphasis more recently. . . . "
Step-By-Step: How To Download All Your Tweets With The New Twitter Archive Service: "Gone will be the days of scrolling through pages and pages of your Tweets or Twitter’s clunky search to find something you once posted. Twitter is in the process of rolling out a “Download all your Tweets” feature, which has been formally announced today on the Twitter Blog. To get your archive, go to the Settings area and look for the new “Your Twitter archive” feature . . ."
Instagram out -- Pinterest in? Pinterest Shows Up to the Twitter Party Just as Instagram Leaves | Wired Business | Wired.com: "If you’re still downcast over the likelihood that your Instagram photos will (probably) never again show up on Twitter’s website or apps, you may get a lift from knowing that Pinterest just added support for Twitter cards (what amounts to a snapshot of the shared content). That’s right, from now on, you’ll be able to see shared pins on Twitter without going to pinterest.com or a Pinterest app. Social media manager and Pinterest power user Kelly Lieberman first noticed the changes. A spokesperson for Pinterest confirmed that the company began limited testing of Twitter cards early last week, before Instagram pulled support. My gut reaction to the news was “Who cares?,” as I’ve never seen someone share a pin on Twitter. Turns out I follow the wrong people, because there are plenty of links to pins on the micro-blogging site. Now Pinterest Twitter cards are popping up as well, where you can expand a tweet to see the pin, the name of the board, and the pin’s description. To see the pin, just click “view photo” on Twitter’s desktop site, or tap a tweet in the Twitter apps. . . ."
How to Create Pinterest Images that People Will Share | Business 2 Community: " . . . Posting a great image can increase traffic, get you more pins and repins, as well as improve your overall presence on the platform. Fortunately for all of us, we don’t have to spend our time experimenting with what works and what doesn’t. In a recent post off of Social Media Explorer author, Mitt Ray, outlines some excellent advice on creating Pinterest images that people will love to share. 1. Use Relevant Labels on Your Images - Great Pinterest marketing really beings with the images you publish on your blog or website. Ray recommends one of the first things that you need to do is to come up with relevant labels for the images that you publish. When someone pins an image from your website or blog post, a label is automatically generated in that image’s description. “When you give your image a good name, it’ll automatically have a good description when someone pins it,” says Ray. I realize that this may be time consuming, but Ray believes that this is the minimum you should do when posting images on your site. 2. Write a Test Message on top of Your Images . . . "
Facebook revamps privacy settings and Activity Log, now lets you untag photos en masse | The Verge: "Facebook today announced a revamp of its privacy settings page and Activity Log, which lets you view everything you've ever posted or been tagged in on the social network. Most noticeably, Facebook’s top toolbar now includes a padlock icon for quick access to privacy settings, displayed in FAQ format. The three most commonly asked privacy questions are listed first: "Who can see my stuff? "; "Who can contact me? "; and "How do I stop someone from bothering me?" Clicking any of these links pops you straight into the corresponding privacy settings, where each setting’s language has been made a lot more clear. . ."
Google+ Communities for Merchants - 'Net Features - Website Magazine: "Merchants tend to put the majority of their social resources into sites like Facebook or Twitter, but it might be time to shift some of that social focus to Google+. This is because having a profile on Google’s emerging social network makes a brand more visible in the search results. In fact, a study from digital marketing and analytics provider Fathom reveals that only 24 percent of the brands on Millward Brown's 2012 BrandZ list actually triggered a Knowledge Graph entry when searched for on Google, and the information for 92 percent of those entries came directly from Google+." . . .Who should leverage Communities? While any type of Web worker can create a Community, merchants might be the biggest beneficiaries of this new feature. . . .Google+ already has a big impact on the SERPs. Additionally, fostering a community around a brand can help merchants establish authority in their niche, build better relationships with customers and acquire more brand advocates. For example, a pet store retailer can create a Community for local pet owners. Within this Community, members will be able to upload images of their kittens, schedule puppy play dates or participate in a Hangout video-chat for puppy training tips. . . .
Google's Lost Social Network: "One embittered user suggested that Steve Jobs was to blame. In a 60 Minutes interview, Walter Isaacson, Jobs’ biographer, recounted a meeting between Jobs and Larry Page. The Apple founder told the Google founder: “Focus. Don’t be like Microsoft doing products all over the map. Figure out what you do best, and keep it focused.” Whether Jobs intended it that way — or if they took his advice at all — the Google founders decided that fewer products meant better products. Madrigal, the Atlantic writer, thinks that’s misguided, and that Google should foster “the nascent but largely invisible communities it already has.” The sharebros might agree, but even Reader’s disaffected engineers acknowledge the importance of unification. “Google has clearly made its bets with G+, and Reader should be part of those plans,” Shih conceded." How to avoid making one of the 10 worst Facebook mistakes | How To - CNET: ". . . #10) Don't let Facebook track you - When it was revealed last year that Facebook was tracking users even after they sign out of their account, the company's response was "trust us," as CNET's Chris Matyszczyk reported in the Technically Incorrect blog. Facebook reportedly altered its tracking cookies subsequently to prevent such snooping, but the Facebook cookies still retain some non-personal information, as researcher Nic Cubrilovic explains on his New Web Order blog. In a post from August 2011 titled "Five ways to avoid being tracked on the Web," I described several browser add-ons that let you allow or delete ads and tracking cookies on a site-by-site basis. The post also explained how to set Internet Explorer, Firefox, and Google Chrome to delete cookies and other trackable information automatically when you close the programs. A post I wrote in June 2011 gives step-by-step instructions for disabling third-party cookies in IE, Firefox, and Google Chrome. Cookie management becomes even more important as Facebook prepares its View Tags tracking program for advertisers, as Josh Constine explains on TechCrunch. . . . "
Should media regulations also include social media? You wouldn't use an otoscope o check a heart rate, so why use LinkedIn for patient education? Choose your social media site based on what you're trying to do. Whether you're a seasoned social media guru, or someone who has spent some time watching a few cat videos on YouTube, no doubt you've wondered: “What made this video/article/blog/website get shared so much?”. Fort Wayne, Ind. (www.incnow.tv) - Business leaders and social media friends from around the area gathered for breakfast and some tweeting Tuesday morning. NYT says Jodi Rudoren mistepped in Facebook comments on Palestinian culture: Ms. Rudoren regrets some of the language she used, particularly the expression “ho-hum. The 36 Rules of Social Media. The 36 Rules of Social Media. http://www.facebook.com/#!/InfiniGraph. Stephen. Posted on: November 28, 2012, 7:03 am Category: Uncategorized. By: Stephen · No comments. Logging In.. There are recent stories about Social Media being bigger and having a greater effect on campaign responses than email marketing. This has caused marketers to rethink their str. The Israel Defense Forces sophisticated approach to social media positions Israel as a defensive actor in the conflict in Gaza--and shows the medium's power . The History Of The Top 6 Social Networks Of All Time - Edudemic: "Well now here’s a fascinating look at the history of social media. From the early days of MySpace (or whatever it’s called now) to the present status of Facebook, it’s all here. It takes a position as being a way to determine if Facebook will survive (only time will tell) or if it’ll turn into something totally different. The following infographic sheds light on the early days of Aol, Yahoo!, Altavista, Myspace, Digg, and Facebook. As you can see, it may be worthwhile examining the rise and fall of each social network to determine the future of Facebook, Google+, and even Twitter. Only time will tell!" Infographic and read more here. New Facebook policy conflicts with European law, concerns privacy advocates - The Washington Post: "The proposed policy also drew criticism from American privacy advocates, who said that the changes would make more data available to advertisers without users’ explicit consent, in violation of last year’s consent decree between Facebook and the Federal Trade Commission. The agreement stemmed from complaints about the company’s handling of personal data. “Facebook is not really telling users what this means and how this is going to work,” said Jeff Chester, executive director of the Center for Digital Democracy. His group is planning to join the Electronic Privacy Information Center in complaining to the FTC about the proposed Facebook policy changes. The agency declined to comment on Friday." Facebook and privacy? That's an oxymoron isn't it? by domlane. Learn about data visualization tools. 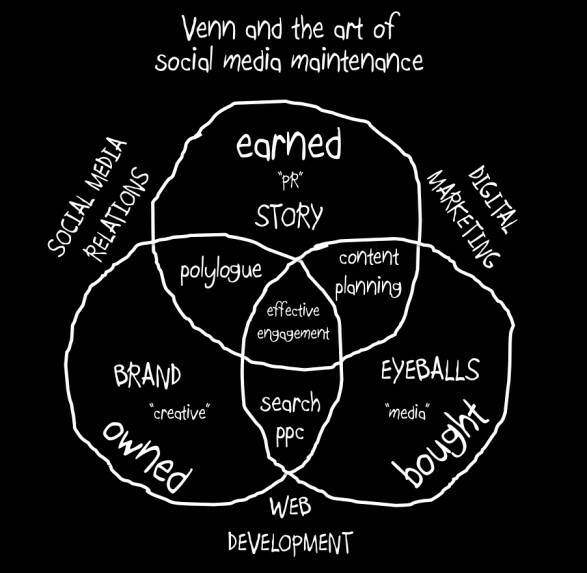 Venn and the Art of Social Media Management | Visual.ly: "A simple model for a universe with effective engagement at the intersection of marcomms, understood as a combination of owned, bought and earned opportunities." The latest episode of The Onion Talks: The world's most successful companies know that social media is a powerful marketing tool, and Cameron Hughes. I get asked everyday, Stuart, how can I use Social Media to grow my MSP business? Want to know the secret to making social media work? Stop broadcasting useless junk and start sharing items that interest your prospects and clients. The Onion pokes fun at social media marketing – and challenges our assumptions. The mechanics of social customer support is changing rapidly. Even if vendors can deliver the technology, will brands be able to keep up with consumers' increasing demands? Although organizations throughout Western Canada have been taking advantage of my services as a technology speaker for a number of years, I have found lately that presentations on social media are becoming more and more popular. Lieutenant Sacha Dratwa (Facebook)Lieutenant Sacha Dratwa (Facebook)Social media have become tools for popular movements like the Occupy Wall Street protest. The Drum recently carried the following article from me, commenting on social media backlashes, and how they could have been avoided. They've been kind enough. 7 Social Media Marketing Tips for Artists and Galleries: ". . . . while fine art is big business, there is often a wide chasm between the creative process that makes a great artist or a sophisticated gallery owner, and the marketing process that drives branding and sales. “For the majority of artists, success will ultimately come down to their effectiveness in marketing,” says Darius Himes, Assistant Director of fine art photography gallery Fraenkel Gallery in San Francisco. “Artists need to embrace the fact that both their work, and they themselves as artists, are brands that must be marketed.” So whether you’re an aspiring artist who wants to build an initial following, or a veteran art dealer looking to expand awareness of your brand, it pays to get savvy to new social marketing techniques to help you achieve your objectives. The following are seven strategies for more effective social marketing. 1. Optimize Your Website . . . . "
Guest post: Can we trust social media publishers to protect our privacy? Can we trust social media publishers to protect our privacy? Barry Murphy, co-founder and principal analyst of EDJ Group, cautions that this question has legal ramifications for every company that uses Facebook, Twitter or any other social service. Will social media decide who lives and who dies? Has the New MySpace Predicted the Future of Social Media Marketing? new myspace The new Myspace was officially launched this week and so far the response has been pretty muted. If you take a quick spin around the web's more popular tech blogs, you're more likely to find old Myspace stories than buzz about the launch. Getting back to the article, and premise, about a dumber state of things, a link with an expanding social media and an elevated state of dopiness is drawn by some. How smart do you have to be to spread hate and anger anonymously on the Internet? Social Marketing Brain-Teaser: Will Apple Jump the Shark by Investing in Twitter? Do we need a 'green cross code' for Twitter? Did We Really Think Social Media Would Stay Free Forever? Did you really think social media would stay free? Let's face it, social media fees pay employees to keep the sites running and up-to-date. Social media could be the answer to finding top performers. It's a generally accepted rule of thumb that 3-5 point of contact (some say 7-9) is necessary for someone to make a hiring decision on you. What that means is someone must encounter your work 3-5 times either by you. A recent study by Firefly Millwood Brown substantiates some of the conventional wisdom aroundsocial media. How do we integrate our website into social media? In this tutorial, we're going to go through 5 essential tips on how to be more social. Digiday - The Authority on Digital Media, Marketing and Advertising. Pinterest Business Accounts rolled out this week could generate even more purchases for small and big businesses alike. HubSpot reports that 47. Prague-based social media analytics startup Socialbakers on Monday announced that it had raised $6 million in funding from Index Ventures and Earlybird Venture Capital. The startup says that more than a fifth of all Fortune 500 companies are its clients. © 2012-2015 Expri Communications LLC All Rights Reserved. email@expri.com. Picture Window theme. Powered by Blogger.